Just recently telecom giant Vodafone launched their new campaign #StrongerEveryHour and the campaign features the network engineers and brings them in the light as unknown and unsung heroes who work tirelessly to put network towers in place that in turn offer a great and uninterrupted network and digital experiences. 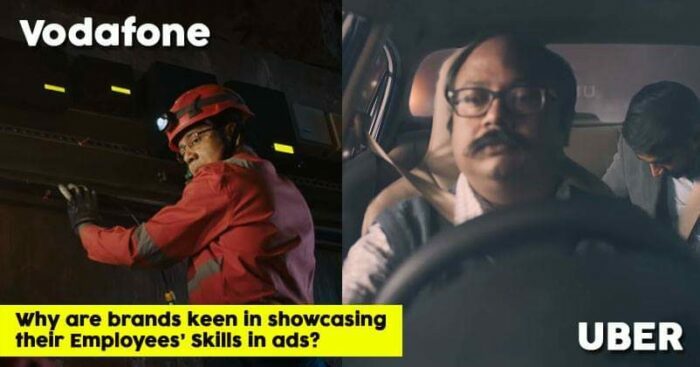 Not just Vodafone, but a lot of other brands have also tried to bring out the stories of their employees in ads and the primary reason that we feel for doing so is a human connection. The real stories always have a deeper impact with the audience because people, in general, are able to relate to such ads more. Food delivery company Swiggy has also showcased the lives of their delivery people and delivery partners in order to make the brand feel more humane. Emphasis on calling the Swiggy delivery men by their name and not address them as ‘Swiggy’ was really a great way to make both customers and employees more connected. Uber has also used stories of their drivers many a time and weaved in their brand message around them. These ads have overall received a great response from the audience, and we see the real-life heroes being the common thread here. On our day to day basis, we see these people in real as compared to celebrities and hence these stories seem more relatable to us. The driver, the delivery man, the doctors, they all exist in our lives in a way closer manner than the celebrities. It’s a great initiative that brands are not just making these ads to connect with the audience in a better way, but also recognizing the efforts of the people who work for them and make them the brand they are.